Top 15 Best Ladies Golf Clubs in 2019 - Make Sure You Read This First! 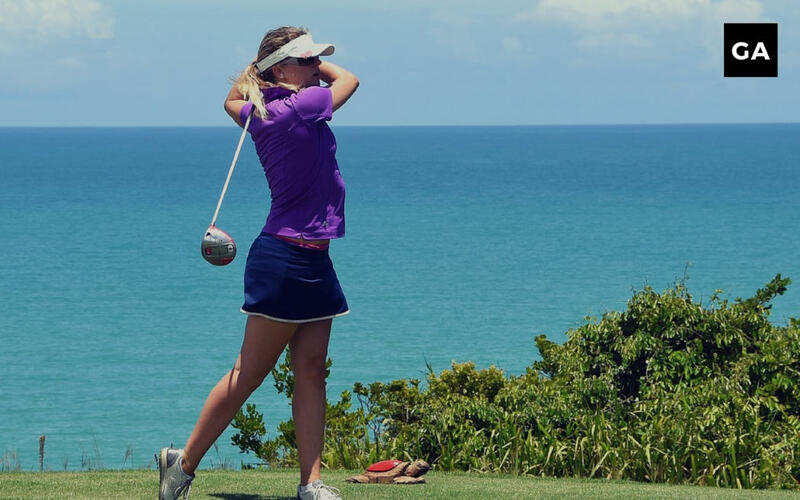 The 21st century has bought many fantastic women across every sport and golf was no exception. While it does have its challenges, setting yourself up with the right equipment is the first key step. There are many golf club sets specifically for women so let’s take a look at the key things to consider while making your decision. The following post explores the differences between men and women clubs and highlights what we consider are the best lady golf clubs in 2019. What’s in a Female Golf Club Set? The 3 woods comprises of 1 driver, 3 wood club and 5 wood club. Of the 7 irons there would be a 4, 5, 6, 7, 8 & 9 club. The wedges are sand and pitching with at least 1 hybrid and a putter. The Professional Golf Association allows a player to have 14 clubs and you are free to choose which 14 you would like. The above list is 13 clubs so feel free to include an extra, alternate club. We recommend using a hybrid club as they are more forgiving and are a bit easier to hit with. As a rule of thumb the lowest numbered hybrid (ie. 3 iron) allows any lady to hit the golf ball a little shorter than that of the highest numbered fairway wood. Roughly 10 or 15yards. For this reason, women golf club sets generally comprise of more hybrids. 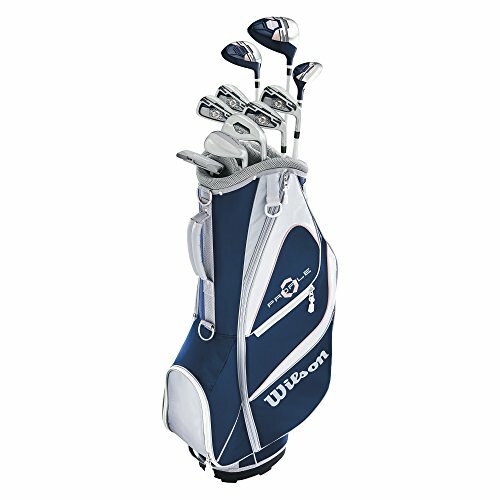 In the golfing world, Wilson is a well renowned brand and the Wilson Ultra Womens set is a great golf set. They are very popular amongst female golfers and Wilson are known to produce fantastic equipment. In this price range, this set offers the best value for money, especially if you are looking for good, quality clubs without the price tag. 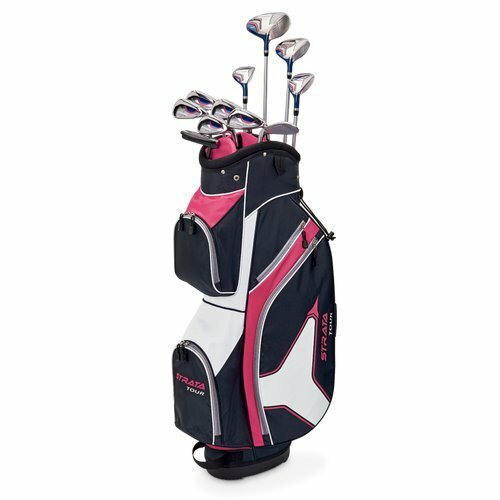 This golf set is recommended for beginner golfers and is considered ideal for standard women of the height range 5’3″ to 5’9″. Perimeter weighted irons and shafts made from graphite these clubs will offer forgiveness. The grip is standard but I think this is sufficient. The only thing that to consider is this is a bag that does not include a stand so you will be carrying them on your back, or you could pair it with a golf push cart. The Wilson Ultra Womens set is available in two different colors – charcoal and mint or plum and citron as well as both left and right handed orientation. The Callaway Strata Plus set is fantastic for beginners to intermediate players. Featuring graphite shafts these clubs will increase your drive and are still very accurate and forgiving. 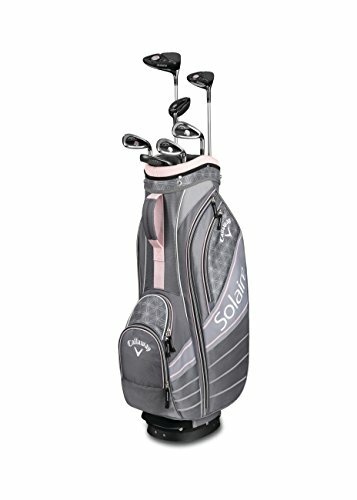 This set is incredibly popular amongst female players and is the equivalent of the hugely popular Callaway Mens set. Bag with five pockets + cooler pocket, rain hood and strap. The shafts are all made of graphite which is very important for female clubs especially for beginners and intermediates. Graphite is much lighter than steel and you will really notice the difference if you have played with mens clubs or second hand clubs and then switch to graphite. With these clubs you are going to achieve greater distance and find it easier to have a consistent swing. Not only this but the irons are all perimeter weighted meaning there is a larger sweet spot. The Callaway Strata Plus clubs present the best value for money in lady golf clubs. They aren’t over priced and are great for beginners to intermediate players alike. Available in purple along with a very nifty carry bag that has all the accessories you need this set will not disappoint. The only negative is that this does not come in a left hand orientation. 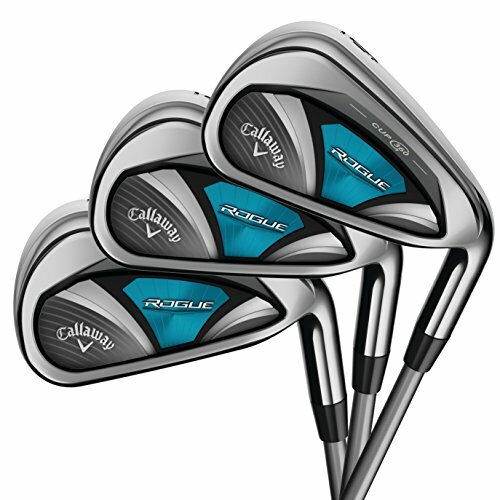 Callaway Solaire Clubs are a near perfect set for the complete beginner to the experienced golfer. These clubs are designed to optimise your golf performance. If you missed the Callaway Solaire Gems Review be sure to read it. With perimeter weighting these are incredibly forgiving clubs and that along with graphite shafts will really improve your golfing. The only real downside of this set is the high loft degree of the driver – some people may find it too high but for others this may be exactly what they need. Boasting high quality reviews the Callaway Solaire Clubs are well worth the money if you take your golfing seriously. 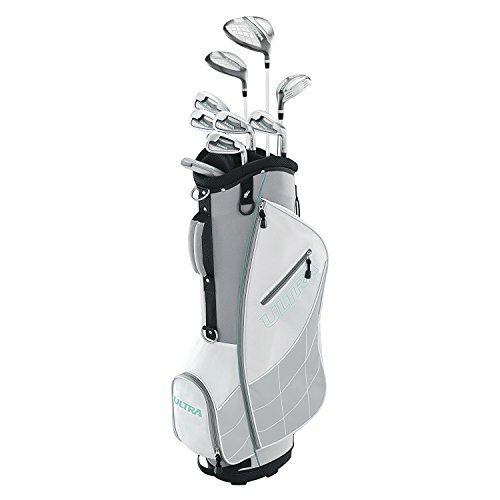 Strata Golf- Ladies Ultimate Set is another great set of golf clubs manufactured by Callaway. Offering quality equipment with a significantly lower price tag than those of luxurious women clubs. These clubs are designed for professional or advanced players and the quality is reflected in that. This is an 18 piece set adding on to the 14 piece strata set reviewed previously. Stand bag that is lightweight, modern and an easy carry back strap. If you are a beginner or intermediate then I wouldn’t recommend this set. The irons have steel shafts which are great if you consistently hit your ball in the sweet spot every time and the extra weight is helpful. As a beginner or intermediate player this set will be difficult to use and likely be frustrating on the course. 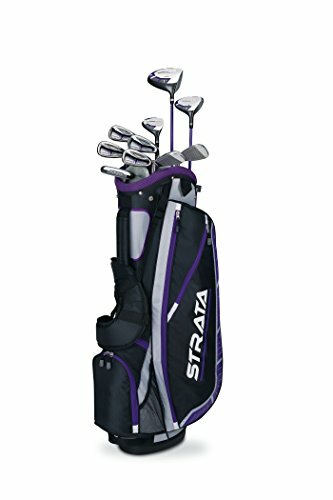 If you are a serious player and are looking for a new competitive set then the Strata Golf- Ladies Ultimate Set won’t let you down. Ultra Light High Modulus 100% Graphite Shaft for all woods! 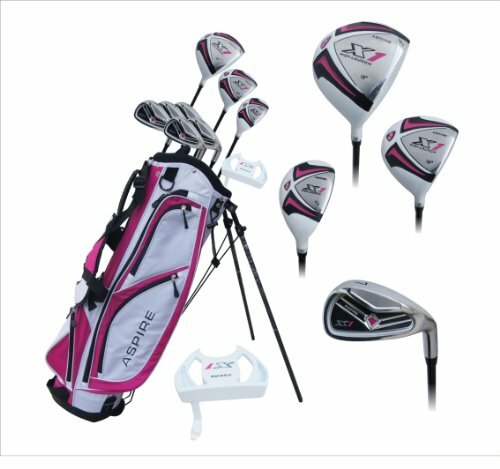 The Aspire X1 Ladies complete golf set is a great purchase for beginner players. if you are already quite confident or an intermediate player then these clubs probably won’t be the best choice. For those who are budget limited then these present great value. Some people do not like the bag so that is something to bear in mind. The only other thing that concerns me about these lady clubs is that the shafts of the driver and irons are made from stainless steel instead of graphite. As a complete beginner I definitely recommend buying golf clubs that all have graphite shafts. Taylormade is one of the biggest names in golf and for good reason! All their clubs are made from quality materials to help you perform your best round after round. 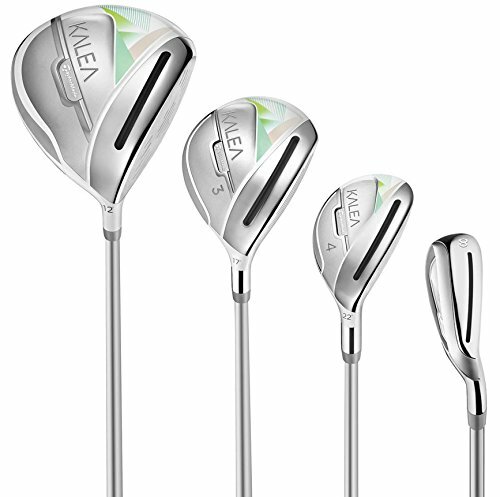 The Kalea Ultralite set is one of the best, if not the best, complete set of women’s golf clubs on the market. 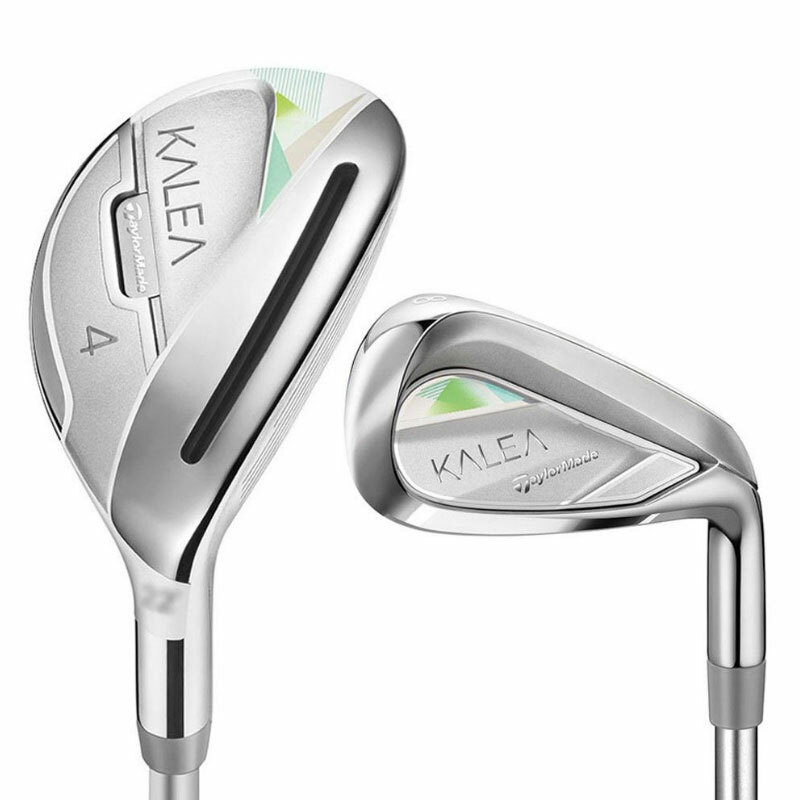 Although, those who want the best are going to need to pay up since the Kalea Ultralite Set is by no means a bargain. This set of Women’s clubs are made and marketed to advanced players that are looking to get a set of clubs to take their game to the next level. Each club includes an ultralite graphite shaft that combines with the speed pocket on the irons and hybrids to create unbelievable swing speeds. A centered low center of gravity helps with forgiveness and better launch angles. Right and left-hand orientations are available and each club comes with premium Ladies Winn Grips already installed. There are some issues with the Taylormade Kalea Ultralite Set. First, there is no bag included to carry the set of clubs. A putter is also not included but since this set is targeted towards the advanced player, it is understandable that the user probably already has a favorite putter of their own. The Cobra Women’s F-Max Superlite Complete Set is not one of the sets of clubs that remove features and instead keep almost every feature that appears on the men’s set. Just like men’s sets, the shafts are a mix of graphite and steel with graphite shafts appearing on driver through hybrid and steel shafts on all the irons. Having all graphite shafts are better for beginner and intermediate players, so with the inclusion of steel shafts on the irons means this set is for an above average player. A progressive style of weighting and offset on the irons are meant to give better stability and forgiveness. The included cart bag does not come with a strap so a push cart or golf cart will be needed. Two color options are available and they include White & Purple Cactus Flower and Black & Lexi Blue. Female Golfers who prefer to have a heavier more traditional weighting style of irons but still want a set of Cobra brand clubs should look no further than the Cobra Women’s XL Complete Set. Each club in the set has the same design and features of the men’s Cobra XL clubs which translates to great forgiveness and distance and all shot types. All shafts, including the irons, are lightweight graphite with a flex that promotes higher launch and faster clubhead speeds. Hybrids and Metal Woods have fixed weighting low on the clubhead while the irons come with perimeter weighting for increased forgiveness. The included grips are a little larger but with more padding for feel and control. Each premium cart bag has 14 individual club slots, 6 zippered pockets, 1 velvet valuables pocket, and 2 insulated beverage pockets. Color options include Black/Capri Blue, Silver/Mint, and Silver/Raspberry. Unlike the other golf sets in this review, the Callaway Women’s Rouge Iron Set only comes with the irons and forgoes other clubs like a driver, woods, hybrids, or a putter. What the set does include are some of the best women’s irons on the market that include game-changing technology that can help intermediate to advanced players alike. Callaway Rouge Irons are regarded as some of the best irons available to men and women thanks to their precision engineering and cutting edge technology. The women’s version includes 360 Cup Face technology which increases ball speed and forgiveness. With a cavity back design, the Rouge Irons increase distance and consistency on full shots from the fairway. A premium Synergy 60-gram graphite shaft comes installed standard and really helps create better ball launch angles regardless of shot type. It’s a little disappointing that no bag or extra clubs are included in this set, but the quality of irons are top notch and perfect for anyone looking to upgrade to one of the best women’s golf clubs on the market. 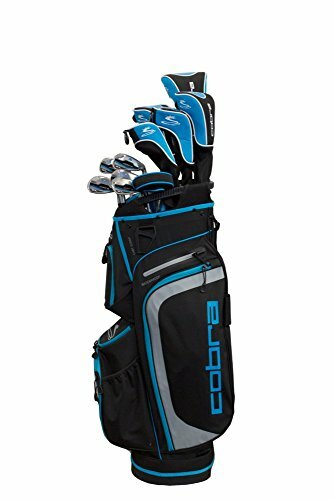 Perfect for beginners and intermediate players, the Tour Edge Ladies Bazooka 260 Complete Set comes with 9 high-quality clubs and a lightweight cart bag to hold everything. The Bazooka 260 Complete Set is an excellent choice for anyone looking to upgrade to a set of clubs that offer a great mix of quality and value. It is this mix of quality and price that makes this set some of the best lady golf clubs on the market. A nice assortment of 10 different clubs are included in the set. The highlight is a large 460cc 12-degree driver that provides great launch and distance off the tee. All clubs except the putter come with graphite shafts which are great for beginners as well as more advanced players. The only thing lacking in this set is that there are no headcovers included for the driver, 3 wood, and 5 hybrid. The Tour Edge Ladies Bazooka 260 Complete Set only comes in right-hand orientation so left-handed golfers will need to look elsewhere. One important thing to note is that marketing materials say that the bag that comes with the set is a stand bag, when in fact the included bag is a cart bag and does not have a strap or extendable legs for easy carrying. Two pcs wood design with innovative Hotter Face insert, a mx material body creates ball speeds and low deep CG for high launch with low spin. It delivers longer distances. The chrome milled finish iron head is a progressive sole shaped iron with innovative Hotter Face insert, a high speed cavity back design for faster ball speed and longer, straighter shots. The Epron TRG Ladies Golf Club Set is the only set of Japanese made clubs in our review, but for good reason! 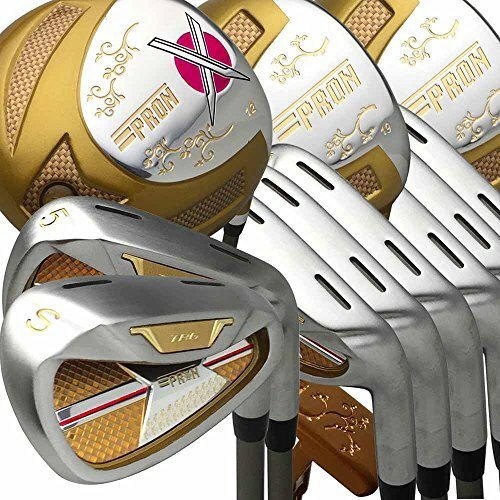 The entire set comes with a flashy gold and silver styling and each club is tuned for performance. Usually gold is expensive, but in this case, the price is just right for those looking to start golfing or want a solid upgrade to better looking and performing clubs. From a styling perspective, the Epron TRG Ladies Golf Club Set cannot be beat! All the fairway woods and driver come with a gold/silver color combination with inlays of gold carbon fiber. Even the irons are stunning and use the gold/silver color scheme and includes a polished gold colored weight. Features such as small speed notches and optimally placed weight are used to create excellent distance and forgiveness. A progressive styling of the sole of each iron is meant to help create the best turf interactions possible. 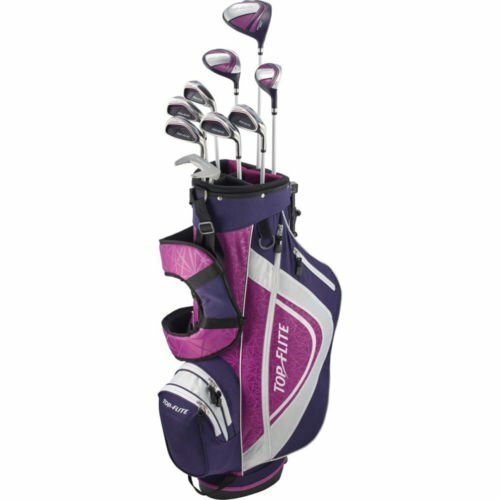 The Epron TRG Ladies Golf Club Set does come with headcovers for the driver and fairway woods but does not come with a golf bag so make sure you pick up a golf bag with this set. If you plan to walk a lot, make sure the bag you choose is a nice lightweight stand bag. Maybe some of the best women’s golf clubs for beginners are the Precise M5 Complete Golf Club Set. Everything you need to get out on the links is included! A great feature of this set is that there are three club length options to help accommodate those ladies who are taller or shorter than average. 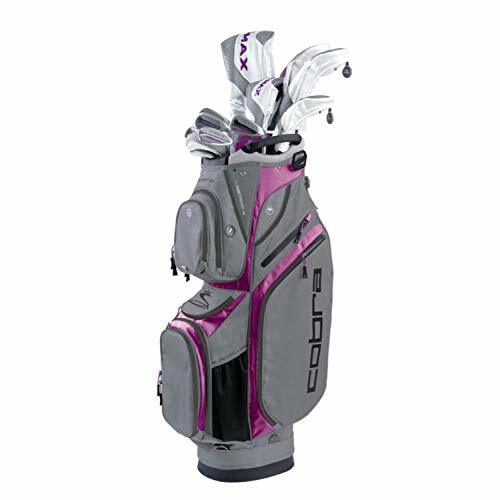 All clubs in this set come with a bright pink graphite shaft to match the color scheme of the included bag. The driver and fairway woods are a little disappointing in the fact that they feel a little cheap, but this does not affect the playability at all. The included irons are all oversized to help with forgiveness and ease of use. They feel much more premium and have good feel on all shot types. Only a pitching wedge is included in this set so those who want a sand wedge in their bag will need to buy one separately. Another highlight of this set is the included carry bag that is constructed of high-quality, lightweight materials. Even an adjustable two shoulder strap is included to help making carrying your clubs almost effortless. Convenience and quality are the two best words to describe the Wilson Women’s Profile XD Complete Set. Each set comes pre-packaged in a box, and all the golfer needs to do is take the clubs out, remove the plastic, and get ready to play! Ten total clubs are included with six of those clubs being irons, one driver, one putter, and two fairway woods. All clubs come with a graphite shaft (excluding the putter) and have a pleasing black/blue/rose gold coloring. The driver, wood, and hybrid all have higher lofts and lower center of gravities to make hitting high shots easier than ever! One important feature included on the irons is perimeter weighting to make the sweet spot on the face much larger. The pitching wedge has been made with advanced spin technology to help create more spin from all lie types. Wilson makes it super easy for ladies to find the right fit for them by providing three different club lengths based on height. Standard length clubs are meant for those between 5 foot 3 inches and 5 foot 9 inches. Anyone who falls outside of those heights can get a petite set or tall set that subtracts or adds an inch respectively. A cart bag is included with this set but does not come with extendable legs. A single shoulder strap is included. Top Flite’s XL series of clubs have been widely popular with beginning golfers thanks to there easy playability and great price. The women’s version has experienced similar success and is one of the best women’s golf club sets on the market. In the golf industry, the Top Flite XL Women’s Complete Golf Set is known as a game improvement set. This means that the clubs are easy to hit and help a player score better thanks to greater forgiveness. To accomplish easy to play clubs Top Flite included features like perimeter weighting on the irons and low profile design on the fairway woods. Plus, each club comes with a lightweight graphite shaft to improve swing speed and distance. Only a right-handed orientation with standard length shafts are available. This is a little disappointing especially for those that are taller or shorter than the average height. Each set of clubs also comes with a premium lightweight carry bag that has two extendable support legs. A backpack style harness is included to help spread the weight of the bag equally across your shoulders. Full set of clubs right out of the box! Maximum forgiveness on the woods and irons equals straighter shots on the course! Matching Deluxe Dual-Strap Golf Bag and Headcovers! Carry your bag like a backpack! Rainhood also included! Recommended Sizes: Petite - below 5'3", Regular - 5'3" - 5'9", Tall - above 5'9"! The Precise M3 Women’s Complete Golf Set is exactly the same as the Precise M5 Golf Set earlier in the review, just with a couple fewer clubs included. This set is perfect for beginners who want to try the sport or for those who only play a round or two a year. Plus with a rock bottom price tag, these clubs are a no brainer! Simplicity is the main design of the clubs included in the set with the driver and fairway woods having a simple rounded design. Even the irons are simple with just a simple plate inserted into the cavity at the back of the club. Just like the M5 set, the M3 Golf Set does include graphite shafts on every club except the putter. Two irons are not included in this set compared to the M5 set and they are the 5 and 6 iron. 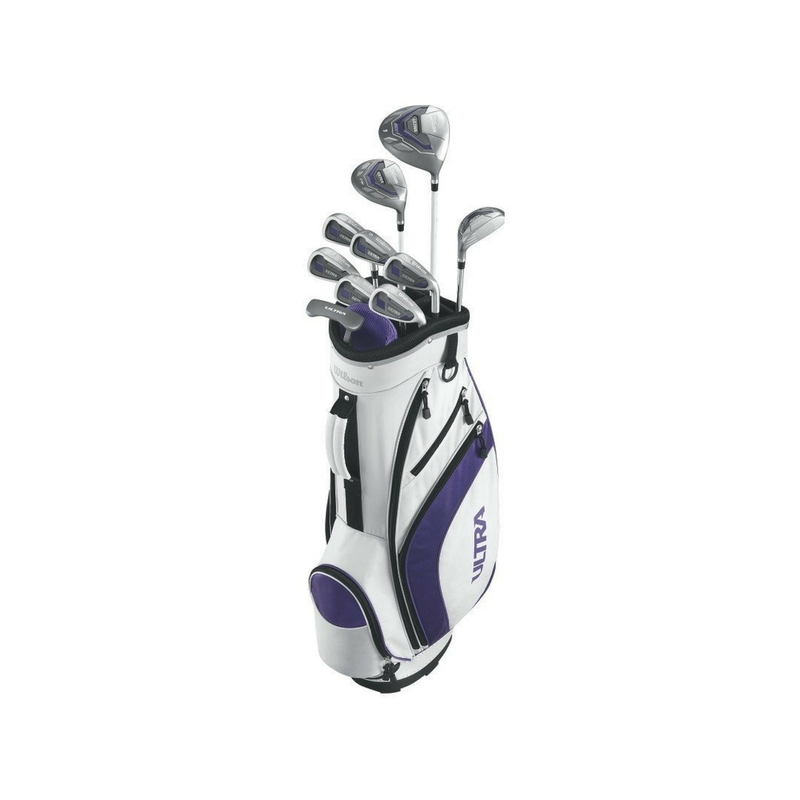 A nice purple and white colored carry bag is included. Two stability legs and a backpack style shoulder straps come pre-installed. Although the same technologies are applied when producing both mens’ and ladies’ golf clubs as a general rule of thumb, ladies clubs tend to be shorter, lighter and offer a bit more flex. There are a few reasons for this, women are statistically of smaller stature and have a swing speed that is a little slower. For this reason, the clubs are made to account for this difference. If you prefer a video over text, this is a good summary. Ladies’ drivers will tend to have a minimum degree of 12 loft which is compared with that of 9 to 11 degrees of mens’. A higher loft is directly associated with hitting the ball more easily off the tee. In addition to this a women driver is much lighter which enables greater distance, speed and trajectory without exerting too much energy. The woods also boast a higher degree of loft and are once again lighter than mens’ woods. In the woods, ladies also have a bigger range to choose from, as high was a 13 wood which can be easier to hit with than a long iron. Irons for ladies’ will have softer flex and in some clubs the head can be slightly heavier. However, like the woods and driver the irons are still going to be lighter than mens’ clubs. They are also slightly shorter than mens’ clubs, however, if you are quite tall custom made clubs are available. The combination of slightly shorter and lighter clubs is tailored to the ladies’ slower swing. Graphite shafts are the most common material for ladies’ clubs. Why? Again this goes back to making the clubs as light as possible – graphite is lighter than steel. In addition to this, graphite shafts also provide a softer flex which provides better club head positioning, power and torque. The length of women clubs are smaller than those of mens’ clubs. Brands such as Callaway and Ping also have clubs that are 2 inches shorter. When considering the shaft length this is going to be very specific to your height. If you are quite tall, opt for male clubs that are made of graphite. Shaft flex has two labels for lady clubs. Label ‘L’ flex provide the most spring and are slightly more difficult to control if you are a beginner. Clubs with the label ‘A’ are less flexible. However, both flexes are suited to swing speeds less than 80 miles per hour which generally speaking is the range of most females. Attesting to the smaller stature of lady golfers, the grips tend to be smaller in diameter as well as length compared with mens’ clubs. This leads to a better grip on the clubs and more control over your swing. Callaway also give the option of tailoring women grips to fit. For both male and female players the two biggest considerations when selecting clubs are the quality and cost. 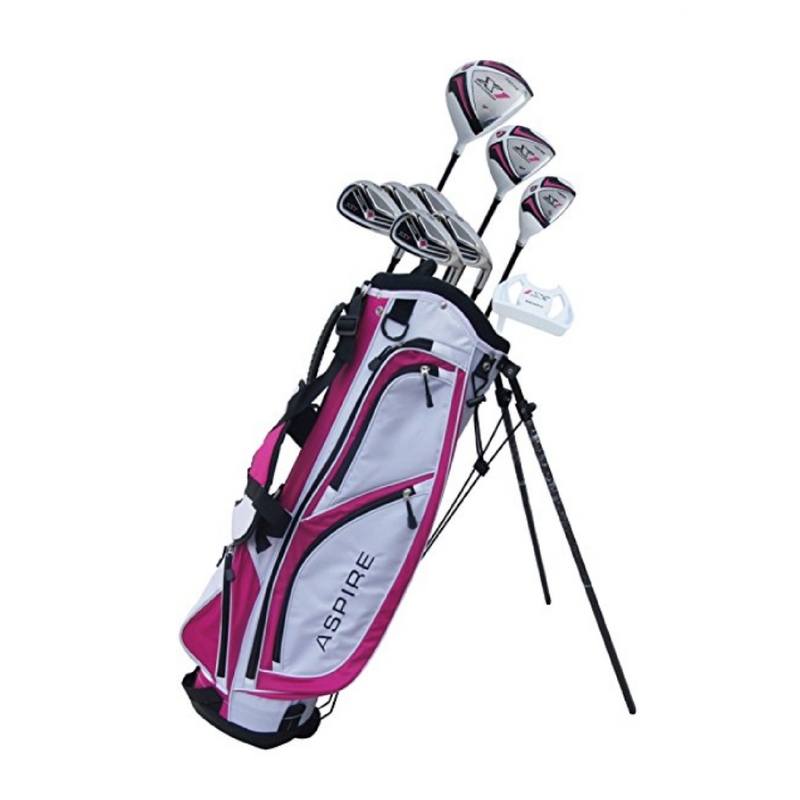 With females, there is a great variety of golf sets on the market. Covering a large range in terms of cost, depending on your budget. The key thing is that you purchase lady clubs, they are designed and produced with the female golfing abilities in mind. Best value for money is going to be buying a complete set, purchasing individual clubs will be a lot more difficult and more expensive in the long run. If you are an advanced player then that might be what you prefer to do, but for beginners and intermediate golfers a complete set is the best option. Ladies clubs usually have a couple significant differences when compared to traditional men’s clubs. Usually, these differences are the use of more lightweight materials in the clubhead and the inclusion of graphite shafts. Another change is that ladies clubs tend to be slightly shorter than men’s clubs. All these changes are to help create more clubhead speed and better distance in all types of lies. One of the best things about many of the club sets featured in our reviews is that they come with all the clubs and bags needed to get out on the course. Even the clubs that do not come with a bag are still a great deal. If you need to purchase a golf bag or are unsure of what bag is best for you, there are two options; cart or carry bags. Many of the more expensive sets of clubs come with a cart bag that is meant to be strapped to a golf cart rather than being carried. Carry bags on the other hand, are more lightweight and come with two stabilizing legs and a shoulder strap. In the end, any golf club set that is included in our review will help you play the best you can every round. And the best part is that no matter your skill level, there is a set for you! When it comes to finding the best lady golf clubs there are a few things that need to be taken into consideration. The main thing is graphite shafts, this is why lady clubs are more expensive than mens. Graphite is much lighter which is going to allow you to gain the most distance and control over you swing.